Sole/Ride: Despite the Boost, this shoe is pretty firm. Combining that with the +11 ounce weight, the shoe feels a bit clunky. The Terrex Boost feels like it has about a 6-7mm drop, which smooths out the ride a bit. The nail in this part of the coffin is the next to zero flexibility. 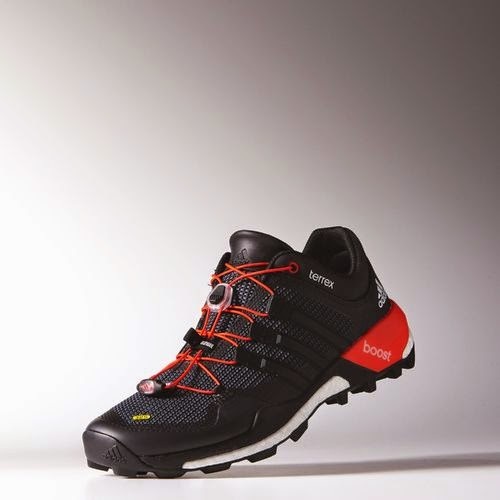 Yes I understand this is a trail shoe, but it doesn't have a rock plate. There is no reason for a lack of flexibility that leaves this shoe feeling clunky. I have to given Adidas credit for the lugs on this shoe though. They are fairly aggressive and I would assume they would dig into terrain very well. I did not take this outside so I could return them and only ran inside, but they do really dig into carpet. Fit/Feel: This is what ultimately killed the shoe for me. 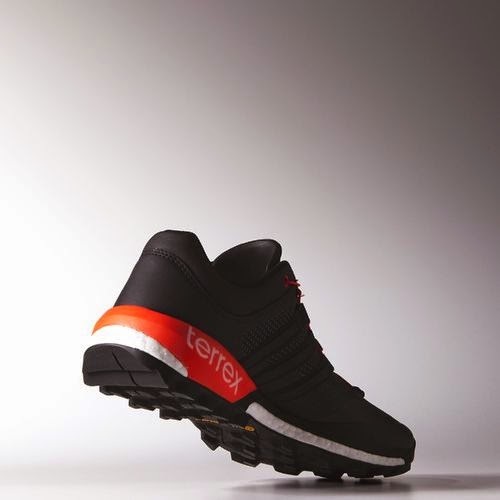 The Adidas Terrex Boost fits long and narrow. Probably 1/8 inch long... which makes me almost consider getting a men's 9.5 rather than the men's size 10 that I tried and normally wear. What has kept me back from trying that is that the upper is very stiff and does not open up with toe-splay. Going down a half size would probably squash my 5th toe and leave me with some nasty blisters. So I decided not to and just return the shoe. I do have to give Adidas credit for something I like. There isn't really a solid heel counter in the shoe, which is good and bad. The good is that the slightly flexible heel of the upper won't irritate your calcaneus bone in the long run and it does a decent job of keep your foot on the platform. The bad is that it only does a decent job of keeping your foot on the shoe. I think this paired with a better lacing system would lockdown the foot much better. I hate lock laces and unfortunately this shoe only has them (no normal laces are included as replacement). My personal experience has been that they don't stay locked down, come loose and do a poor job of keeping my foot on the shoe. I had this same experience with the Hoka Huaka (REVIEW) and immediately replaced them after my first run in them. Maybe I'll have a better experience someday. At the moment..... keep them off of my shoes. Reason For Return: I really wanted to like this shoe. I've been watching it for over 6 months and was excited to try it out. 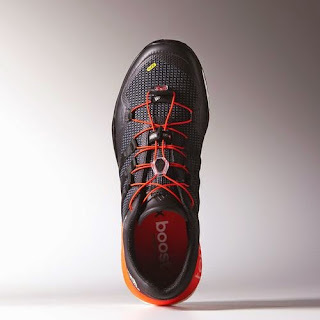 However, given the lack of responsive Boost feel, the lack of flexibility in both the forefoot and upper, the heavy weight, narrow and poor fit, and clunky feel, I really feel like this shoe is not worth the $160 price tag. Thus I have elected to return it and will keep looking for a good trail shoe. Hopefully Adidas will do some major modifications to version 2 or I'll attempt to get my hands on a pair of XT Boost and go from there. As always I am not trying to scare anyone away from this shoe. If you have a long and narrow foot and are also looking for an aggressive trail shoe that will handle almost anything you throw at it, give this shoe a try. If not, look elsewhere. Disclaimer: These shoes were a personal purchase from Amazon and were returned. I only ran on the carpet and the hallways of my apartment to keep the shoes in good enough condition to be returned. My thoughts are based on 5 years working in running specialty stores and experience with more shoes than I can count. If I ever receive the shoes for free I will put them through their full paces, but as a graduate student with little money I have to be careful with my shoe purchases. Thank you for reading. 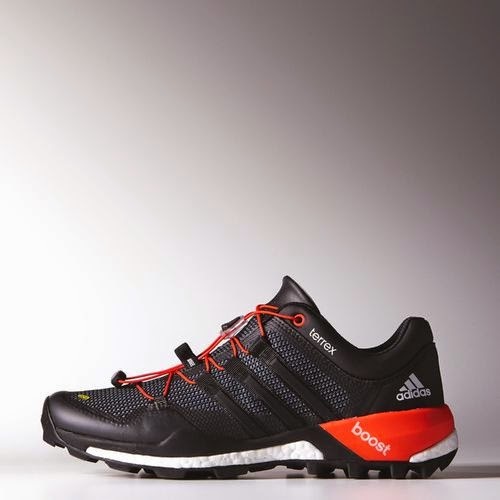 *Images obtained from the Adidas Running website.